We’ve had a pellet stove in our home for over 20 years. It never ceases to amaze me how these incredibly efficient, cost effective, and green sources of heat are still a mystery to so many people. Wood pellet stoves are generally small, and the bags of pellets are about the size of a mulch bag, making them easy to purchase and store. Bags can easily be found around town and we can buy a few at a time; minimizing storage space throughout the winter. They’re also easy to operate; they only require loading pellets and igniting the flame. Our stove lights with a press of a button. The average stove needs to be loaded only once a day. (HowStuffWorks) Cleaning is also very simple. A small collection box can be emptied when a new bag is loaded. The ash is about a cup full. Because of the high efficiency of our Haven™ design, a bag of pellets that cost about $4.50, will last about 2-3 days, depending on the outside air temperature. We’ve been using our pellet stove as our sole source of heat. With 3-6 hrs of operation a day, this efficient heat source has been keeping our average temperatures inside in the mid 60’s when the outside temperature dips below freezing nightly. A good rule-of-thumb when selecting the right size stove for your home is that a stove rated at 60,000 British Thermal Units (Btu) can heat a 2,000-square-foot home, while a stove rated at 42,000 Btu can heat a 1,300-square-foot space. The stove we selected for our 1600 sf. 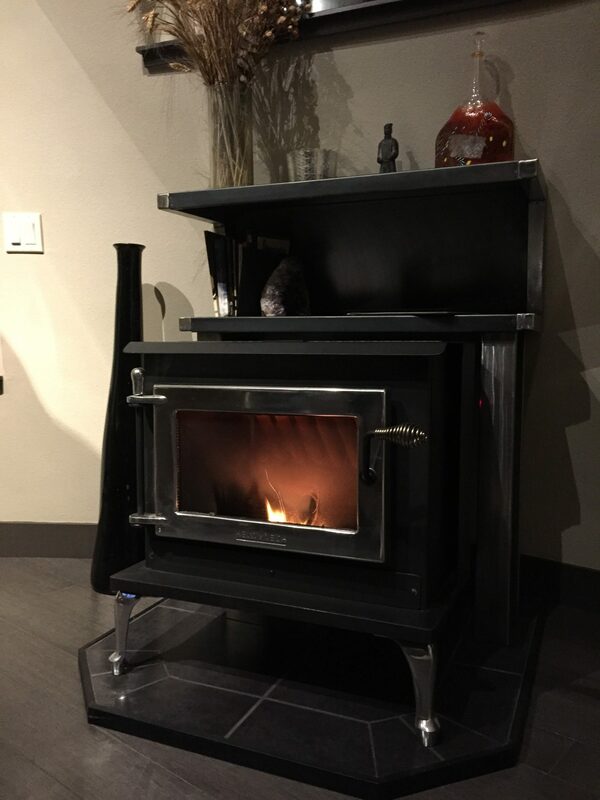 Haven™ is the smaller Heat Tech GMI 26 stove from Dan The Stove Man in Sparks, NV. Why are pellet stoves clean, green and highly sustainable? Pellets are made of highly compressed wood waste, or “re-purposed” material. Because of their compact design, they put out a lot of energy in every little nugget. Pellet stoves burn fuel so completely that very little creosote builds up in the flue, posing less of a fire hazard. Pellet flue pipe doesn’t require cleaning as often as a wood flue pipe. In addition, a smaller diameter and SHORTER pipe can be used, reducing the initial cost of installation. Pellet stoves can be directly vented out the back wall. Wood stoves must go up and out the roof. There is a down side to pellet stoves. They take a very small amount of electricity to run the little auger that feeds the pellets to the flame. Under normal usage, they consume about 100 kilowatt-hours (kWh) per month. 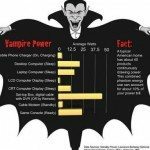 (Energy.gov) If you’re grid tied and in a cold weather climate that loses power for long periods of time, you will have to have a back up generator or batteries. Some pellet stoves can be purchased with battery backup. 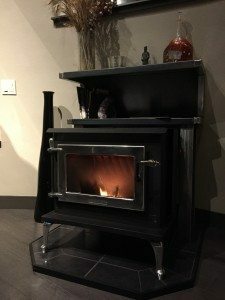 In our next post, we’ll share information about how you can save up to $1200 in Washoe County Nevada when you trade in an old wood stove for a new pellet stove. We look forward to your comments. Please share this blog with other sustainably minded folks. Envirohaven® provides Sustainable Housing Solutions for those that seek more comfortable and usable interior space, more energy efficiency, and more durability with fewer materials and less maintenance. The Haven™ home offers a perfect solution for those seeking a sustainable lifestyle in remote and rural locations.